The earth has been subject to three periods of significantly low temperatures during the Phanerozoic eon extending back 540 million years (Ma). These ‘Ice-House’ periods occurred at the Ordovician-Silurian transition (444Ma), during the Upper Carboniferous (380 – 250Ma) and most recently, the Quaternary epoch beginning 2.6Ma. This consists of the Pleistocene glacial phase and the warm, post-glacial, Holocene phase of the last 11,000 years or so. maximum about 20,000 – 18,000 BP (Before Present) and to have largely melted by 15,000BP. The warm spell that followed was interrupted by a cold period when ice readvanced in northern Britain between 11,000BP and 10,000BP. The development of more sophisticated dating techniques using oxygen isotopes in Greenland ice-cores, Marine Isotope Stages, and cosmogenic isotope analysis has allowed a more accurate picture to emerge of recent glacial events. In the Yorkshire Dales evidence from these sources has also been supplemented with that from dated cave deposits or speleothems. The outcome of all this research is that at its maximum, the last (Devensian) ice sheet completely buried the uplands of northern Britain with between 800m and 1000m of ice covering the Yorkshire Dales. This ice reached its greatest extent as early as 27,000BP off NW Scotland but possibly as late as 23,000BP in Cheshire and the Vale of York. Slow dissolution of the ice was beginning by 20,000BP and continued until about 15,000BP when there was a marked upturn in temperatures. 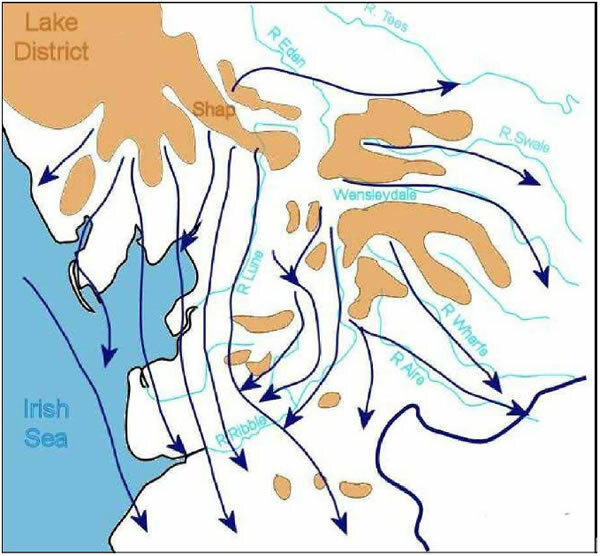 This was followed by the Loch Lomond Re-advance cold phase between 12,500BP and 11,500BP when corrie and small valley glaciers developed in the Lake District and Dales. Early models of ice flow directions during the Devensian were largely based on the distribution of erratics – rocks which had been transported by ice from their outcrops. Most useful for this purpose were rocks such as Shap granite which were not only distinctive but emanated from a very limited source area. With the advance of petrology, it has become possible to identify the ‘fingerprints’ of many more rocks and tie these to points of origin. By plotting the finds of rocks from known provenances added to much more field evidence and computer modelling, it has become possible to build up a detailed picture of ice movements throughout the glaciated area, together with shifting icesheds (Fig. 1). Glacial erosion has probably occurred many times in northern England during the succession of cold phases which have been repeated over the 2.6Ma of the Pleistocene period. Unlike deposition, which tends to be removed during the next glacial stage or stadial, the effects of erosion are cumulative though they may of course be masked by subsequent deposition. Glacial erosion occurs broadly in two ways: abrasion and quarrying or plucking. Some workers also include the action of sub-glacial meltwater. Abrasion is caused by rock fragments embedded in the base of the ice being dragged over the underlying rock and wearing it away with a ‘sandpapering’ effect. Quarrying involves the fracturing, entrainment and transportation of often much larger rock blocks. Both processes are affected by the temperature of the basal ice such that no erosion at all may take place beneath cold-based glaciers while increasing temperatures are likely to result in sub-glacial meltwater which in turn tends to increase ice velocity. Rock structures such as bedding and jointing can greatly influence erosion rates since they help to determine the size and shape of blocks. Increased ice velocity also generally increases rates of glacial erosion. Erosional landforms vary in scale from fine scratches to huge glacial troughs and streamlined hills or rock drumlins. Scratches, or striae, are produced by abrasion and are often associated with ice-smoothed surfaces (Fig. 2). They may occasionally attain extreme dimensions but they are more likely to be accompanied by crescent-shaped friction cracks and chatter marks produced by rocks embedded in the basal ice ‘bouncing’ over the bedrock surface rather like a windscreen wiper juddering across a dry windscreen. Where ice encounters beds of upstanding crags of resistant bedrock, the up-ice slopes will tend to become smoothly abraded while the down-ice slopes, if steep enough, will be subject to quarrying, though this process may be affected by several considerations such as ice thickness, basal ice temperature and rock structure. Together, such features are called roches moutonnée (Fig. 3) but they are only the commonest of a wide range of streamlined erosional landforms which include crag and tail and whalebacks or rock drumlins. Returning to negative features, while striae are typically measured in millimetres, rock grooves may be hundreds of metres long and up to a meter deep. Glacial troughs are several orders of magnitude bigger again, being characteristically pre-glacial valleys which have channelled ice flow away from source areas. While in cross-section they often display a smoothed ‘U’ shape, their long profiles are often irregular with definite rock basins. These reflect variations in resistance to erosion by the bedrock and differences in erosional potential by the ice consequent upon its varying depth and/or velocity. Troughs are naturally most common in mountain ranges where they are the signature landform of valley glaciers. However, they are also sometimes found in lowland areas, such as beneath the Lancashire Plain. Here, ice-streaming through pre-glacial valleys or parallel to fault shatter belts in the rockhead has produced a network of NW – SE trending buried valleys, many of which contain deep rock basins which is an important indicator of glacial erosion, though high pressure sub-glacial meltwater streams have probably also played a role in their excavation. In areas of strongly-contrasted horizontally bedded rocks such as the Yorkshire Dales, the weak bedding and variable nature of the Yoredale beds, for instance, has generally led to their marked erosion but with the thicker sandstones tending to be left as steep crags in the upper valley profiles (Fig. 4). At lower levels, the ice has encountered the much more competent Great Scar Limestone beds. 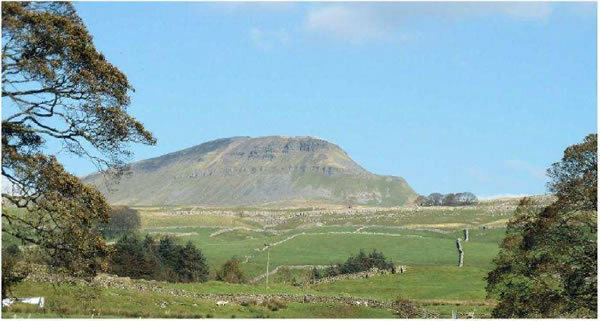 These have tended to resist erosion and are left today as a series of characteristic limestone pavements separated by steep crags. Rock debris produced by erosion beneath the ice is supplemented in mountain areas by sediment which falls onto the ice surface from the slopes above the glacier. Both types of material are then transported from their source areas to be deposited perhaps many kilometres away. Sediments generated in this way are typically unsorted but, depending on the distance travelled, may contain fragments which have become rounded by attrition and the whole mass of deposited sediment may acquire some structural elements with elongated fragments assuming a preferred orientation. The rock types found in the sediment mix reflect the varying bedrock over which the ice has passed. The most widespread deposit laid down directly from ice sheets is diamict or lodgement till, formerly known as boulder clay (Fig. 5). Since the process cannot ordinarily be observed, there are a number of theories concerning the mechanics of deposition each of which probably apply to differing conditions beneath ice sheets. Central to these processes are the notion of drag between particles at the ice/substrate boundary. Where this exceeds a given degree, rock particles will slow to a stop while the ice above will continue to flow over it. Factors influencing these conditions include the thickness and velocity of the ice together with the pressure of meltwater at the base of the ice. Where a lodgement till has been deposited under a considerable thickness of ice, it will become ‘over-consolidated’ by the high downward pressure of that ice. Such till is characteristically extremely stiff, with low moisture content. Some tills, however, are produced during deglaciation by the melting-out of rock debris from the body of ice. These deposits are not subject to high pressures so are not consolidated like lodgement tills. They are ablation or melt-out tills and are generally found high in a sequence of till deposits. Although tills are the most widespread form of glacial deposit, they tend to result in lowrelief plains and drapes which often mask a more interesting rock-head surface such as that beneath the Lancashire Plain. Moraines, on the other hand, being more often formed at the ice margins, show much more distinctive form and relief. In upland areas of valley glaciation the most common moraines are formed along the lateral margins and in NW England are especially common adjacent to former glacier snout positions. They typically occur in suites representing successive positions of the ice margin. Classically, terminal or cross-valley, moraines are formed at the snout either by a stillstand of an active glacier when ice melting just balances snow input, or by an active forward thrust resulting in a push moraine. Cross-valley moraines up-stream of a terminal moraine are produced during a minor re-advance of an otherwise retreating glacier and are called recessional moraines. However, once the snout has retreated up-valley, the quantity of meltwater produced by that recession is often sufficient to erode much of a cross-valley moraine away. The final dissolution of an upland glacier often takes place at the head of a valley trough or in a col. Here, a mass of ice will become stagnant – since it is no longer nourished from above – and will melt in situ producing a mass of low morainic hills, like small circular drumlins, known as hummocky moraine. There are excellent examples of all these moraines in many of the Lake District and some Dales valleys which were produced at end of the Loch Lomond Re-advance period. Moraines produced by lowland ice sheets tend to much more massive features reflecting the more extensive nature of the ice sheet. However, the lack of restricting topography often blurs the distinction between lateral and terminal features. Also, since their deposition took place many thousands of years prior to the Loch Lomond Re-advance moraines, they have been subject to prolonged degradation which has significantly reduced their slope angles and elevation. In NW England, there are no major ice sheet terminal moraines. The ice reached its maximum southerly extent south-west of Wolverhampton while to the east, it butted up against the Pennine uplands in a zone which also saw the concentration of vast volumes of highly erosive meltwater which appears to have effectively removed most morainic deposition. Apart from well-formed cross-valley moraines at the outer ends of some southern Lake District valleys (which, strictly, were produced by valley glaciers), the only largescale lowland moraine is the Kirkham recessional moraine in the southern Fylde, though this is a relatively subdued feature. There are probably remnants of a lateral moraine feature extending from Pleasington, SW of Blackburn to Standish, south of Chorley, but this is much incised by the network of huge meltwater channels referred to above. having been re-occupied by fluvioglacial rivers on a number of occasions. Fluvioglacial deposits, being unconsolidated and easily eroded, have been subject to significant fluvial and aeolian reworking in the post-glacial period. The most common features associated with fluvioglacial erosion are meltwater channels. These are characteristically flat-floored, often steep-sided valleys ranging in size from a few metres across and tens of metres long, to hundreds of metres across and many kilometres long. However, meltwater channels take many forms reflecting the variety of circumstances in which they have formed. Based on extensive evidence around Glen Roy in Scotland and the North Yorkshire Moors, it was once thought that all meltwater channels were spillways from pro-glacial lakes. The lack of corroborative evidence for many such lakes together with a more informed understanding of lateral, sub- and en-glacial meltwater drainage systems has led to most channels being reinterpreted. Meltwater channels are frequently disconnected from the active post-glacial drainage network though present-day streams may occupy sections of pre-existing meltwater channels. In upland areas, series of sub-parallel meltwater channels are often seen cutting across a prominent ridge which lies transverse to the general direction of meltwater flow. Successively lower channels usually indicate a lowering sequence ice-margin positions. Where channels cut through cols in ridges, they often have a ‘humped’ long profile, however, indicating that the meltwater has flowed sub-glacially uphill under hydrostatic pressure (Fig. 6). Where channels are incised into a hillside, they are typically inclined continuously at a low gradient, although occasionally with sections which turn sharply down slope at a high angle. These have generally been cut sub-aerially along the margins of the ice or subglacially close to the ice margin. As with col-notched channels, these may also have undulating long profiles when produced sub-glacially. Another feature of meltwater channels is their often discontinuous nature and lack of relationship to the post-glacial drainage system. Some marginal channels consist only of a bench or half channel, the other half having been cut into or formed against the ice margin. This reflects a wider tendency for both englacial and supraglacial meltwater streams to migrate from time to time between the ice body and the underlying ground surface leaving anomalous fragments of channel when the ice melts (Fig. 7). 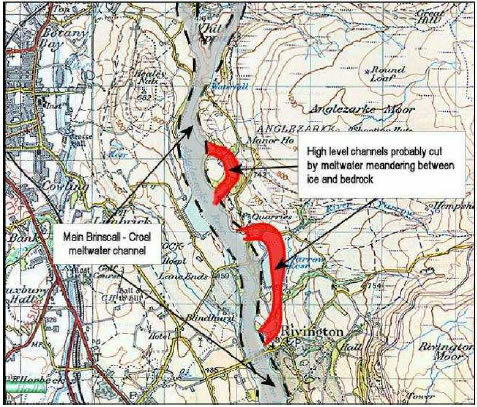 A final group of meltwater channels, particularly well displayed in Lancashire, occur at low levels and are large features such as the Brinscall – Croal channel, also shown in Fig. 7. They form an integrated system related to pro-glacial drainage requirements (though not the post-glacial drainage) and are associated with large-scale sand and gravel deposits. This network of channels is broadly confined to a belt up to 5km wide extending westwards from the M6/M61 corridor which marks the upland/lowland boundary. The system is best seen in the Chorley area (Fig. 8) where the integrated nature of the channel system suggests their creation in a pro-glacial environment, though the channel network seen today is unlikely to have been produced once-and-for-all as a single entity. More likely, a.
succession of large marginal channels was created and destroyed as the ice front repeatedly advanced eastwards then retreated at the edge of the lowland and many of these have coalesced into a more unified system. Fluvioglacial deposition – characterised by sorted and stratified sand and gravel deposits – is by its very nature often found in association with meltwater channels. This is especially true of the lower and larger channels though not all depositional features result from extraglacial meltwater flow. Equally, since maximum volumes of meltwater occur during the later phases of deglaciation when ice is confined to lowlands and valley bottoms, these are likely to be the locations where meltwater deposition is most likely to occur. In Lancashire, however, although there are considerable sand and gravel deposits, these frequently do not give rise to distinctive and prominent landforms. 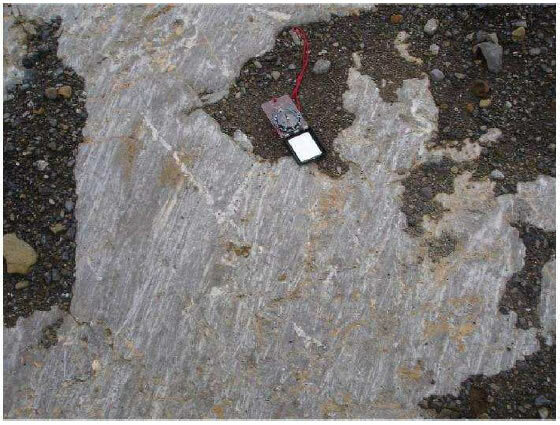 In fact, the larger accumulations of such material are often buried under a thin layer of ablation till; others tend to either infill buried rockhead valleys or occur as extensive featureless spreads. A further group occupies some of the major valleys such as the Ribble and Lune though often in a re-worked form as river terraces and flood plains. Some landforms appear to be quite subdued having been possibly affected by subsequent weathering and mass-movement while others have a much ‘fresher’ appearance with steeper slopes. The presence of fluvioglacial material may often be deduced – with care – from vegetation, especially the widespread presence of gorse and broom. Improved grassland often seems to be greener on sand and gravel unless affected by drought conditions. Proceeding from upland to lowland locations, smaller suites of meltwater channels cutting across moorland ridges are occasionally accompanied with local deposits. Locally more common, however, are conical mounds a few tens of metres high at most known as kamiform or perforation deposits. These result from the accumulation of sand and gravel within open crevasses or vertical shafts in the ice called moulins. As the ice melts and its support is removed, the contents of the moulin collapse into a distinctive small hill (Fig.9). Where meltwater deposits sand and gravel between the edge of an ice sheet and a valley side, the result is often a kame terrace with a relatively steep slope on the ice-contact side. Compared to many parts of Scotland, these are relatively rare in Lancashire though there are examples in the Conder valley, south-east of Lancaster. In the final phase of melting, parts of an ice sheet may become buried by tills and meltwater deposits. Eventually, the buried blocks of ice will melt and the void created will be reflected on the surface by an enclosed hollow, often surrounded by sand and gravel deposits. The hollows, known as kettle holes, are often occupied by small lakes or peat deposits while an area marked by several such features is known as kame and kettle topography, an example of which may be seen south of Malham Tarn. Eskers are long, sinuous ridges of gravel and cobbles deposited by meltwater in tunnels within the ice. On melting, the ice which supports the deposits at the time of their emplacement is removed leaving them to collapse. 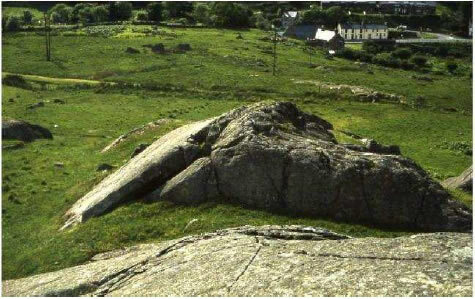 The resultant landforms therefore tend to range between relatively high distinctive features to low swells which merge into a morainic landscape. The length of eskers varies from a few tens of metres to many times that. In North West England, there are few features with the fresh appearance of more recent Scottish eskers. 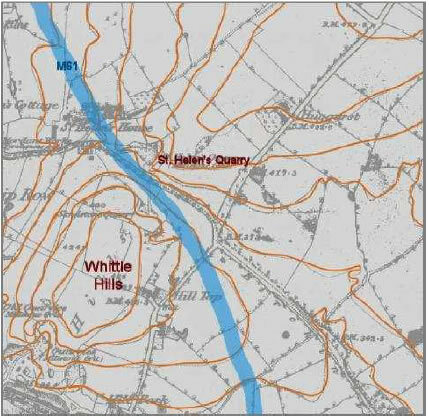 Those that have been tentatively identified – around Garstang and south of Long Preston – have relatively flat cross-sections reflecting their greater age or the nature of their constituent materials. Drumlins are low, streamlined hills having a long axis oriented parallel to the direction of the ice flow which formed them. Typically, they occur in extensive ‘swarms’ where ice has debouched from an upland valley into adjacent lowland though they also occur within the valleys themselves. 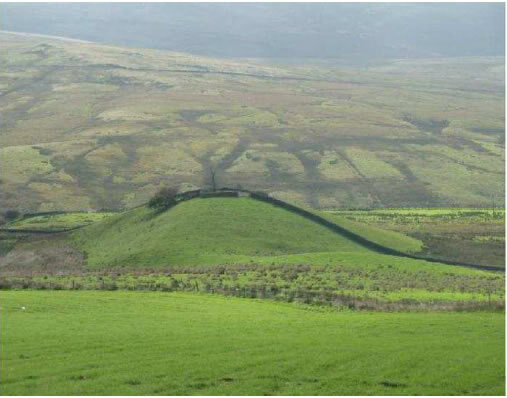 Such landscapes have frequently been termed ‘basket of eggs topography’ though recent research suggests that this may be misleading since the modal relief (height) of British drumlins is less than 4m as against a length which is typically 125 times that. Drumlins may be seen in the Long Preston area extending south and southwestwards of Skipton (Fig. 10) and in the lower Lune and Eden valleys. In the latter location, one set of drumlins can be seen to be superimposed upon another. 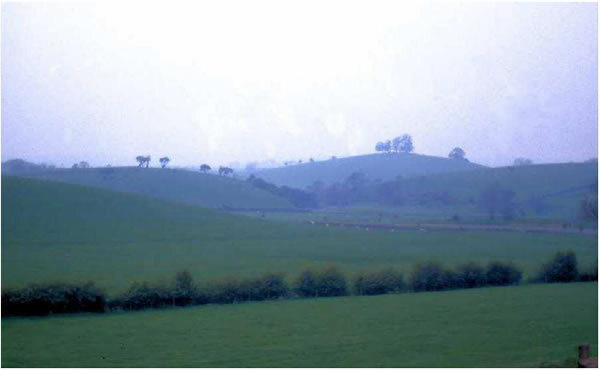 Although the general form of drumlins as described above is regarded as being characteristic, there is, in fact, considerable variation in their degree of elongation, composition and mode of formation. ‘Drumlins’ with a width-length ratio in excess of 50 are now classified as ‘megaflutes’ while ‘rogens’ are drumlinoid forms whose long exes are oriented at right-angles to ice flow. All are collectively known as subglacial bedforms. The composition of drumlins is most commonly lodgement till, stratified sediments or some mixture of the two. 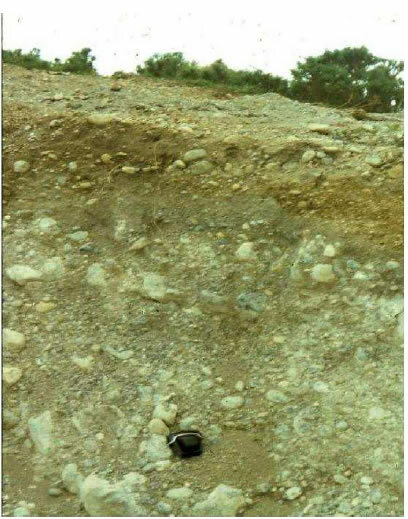 Other drumlins have a rock core, with or without a coating of unconsolidated materials. 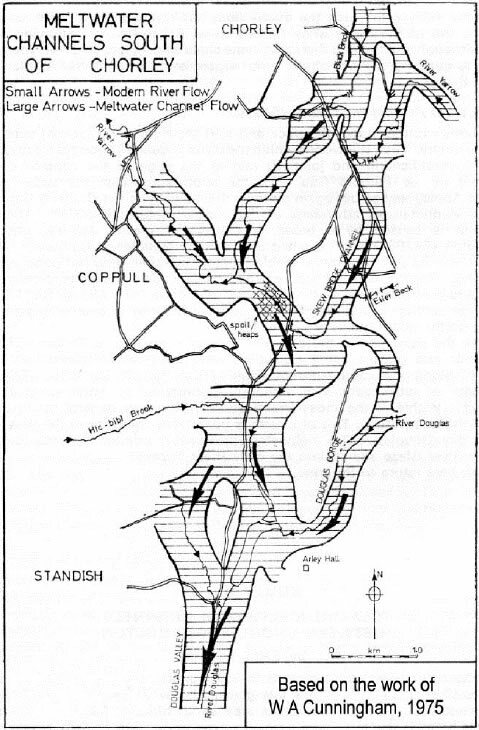 Accounts of drumlin formation need to explain the form, orientation, composition and distribution of drumlins. Given the considerable variation in each of these factors it is likely that the processes of drumlin formation are also varied. On the other hand, the fact that drumlins having broadly similar characteristics occur repeatedly in any drumlin field suggests that whatever processes produced them also operated on an extensive scale. The many published theories propose drumlins, first, to be the product of extensive deposition, erosion or deformation of till by basal ice. Alternative theories, second, see huge sheets of subglacial meltwater as an agent of erosion of till sheets into streamlined forms or, third, as eroding negative drumlinoid voids into the underside of an ice sheet which are then infilled with sediment as the water flows subside. Most recent research has moved towards more quantative methods and the modelling of instabilities in the subglacial system in an attempt to isolate with analytical rigour the processes at work. However, it seems unlikely that one unified theory of drumlin formation will emerge for some time yet.